Operation Rheinübung ("Rhine Exercise"), the sortie into the Atlantic by the German battleship Bismarck and heavy cruiser Prinz Eugen on May 18th to May 27th 1941 could have ended different such as: What would have happened if Bismarck had arrived in Brest? or would having the Tirpitz along have changed anything, here are 5 hypothetical scenarios in which Operation Rheinübung could have ended differently that what happen in OTL. Scenarios I: Bismarck escapes the British net and reaches Brest on 28 May 1941. Let's say that the fatal torpedo hit in the rudders did not occur, and the Bismarck entered in Brest on the following day. After sinking the Mighty Hood and four days of continuous chase, Bismarck's crew would have been received as heroes. Possibly even a welcome greater than that Prien and the men of U-47 received after sinking the Royal Oak in October 1939. The victory would have gone without any doubt to the Germans, although their primary objective (sink British merchant shipping) wouldn't have been accomplished. Therefore, despite of damaging the prestige of the Royal Navy and angering Mr. Churchill (who probably would have fired a few of his Admirals), from the operational point of view, Bismarck's sortie would still be somewhat of a failure. Moreover, due to the damage received in the Denmark Strait and the following torpedo hits, the Bismarck would have had to enter dry dock for repairs. This would frustrate her prompt return to the Atlantic as the battleship could not be utilized again for at least the next two months. Assuming the RAF would not damage the Bismarck again at Brest, the ship could resume its operations in the autumn, and maybe try to join the Tirpitz sailing from Germany. Otherwise, it is likely that Bismarck, together with Scharnhorst, Gneisenau and Prinz Eugen would retreat to Germany through the English Channel early in 1942. With all the battleships back at home, the Bismarck could be then sent to Norway and operate together with the Tirpitz against the Allied Arctic convoys in 1942-1943. That would have tied down even more Allied warships in Scapa Flow, but that is another story and I won't go any further on that. Scenarios II: Bismarck escapes undamaged and gets lost in the Atlantic after sinking the Hood. Now let's say Bismarck and Prinz Eugen receive little or no damage during the Battle of the Denmark Strait. They then reach the Atlantic and break contact with the pursuing British forces. The German ships could then concentrate on the British convoys. The use of a powerful ship such as the Bismarck for merchant raiding offered great promises of success indeed, as she could tie down the British battleship escorting a convoy therefore allowing the Prinz Eugen to attack with impunity. Both German warships could have managed to sink 20-30 ships (Scharnhorst and Gneisenau sank 22 in two months) and then return home in August. That of course wouldn't have changed the course of the war, but as the British were already suffering heavy losses to the U-boats, a "few more tons" of valuable shipping lost to surface ships could make the difference and force the Admiralty to take further measures in this regard. 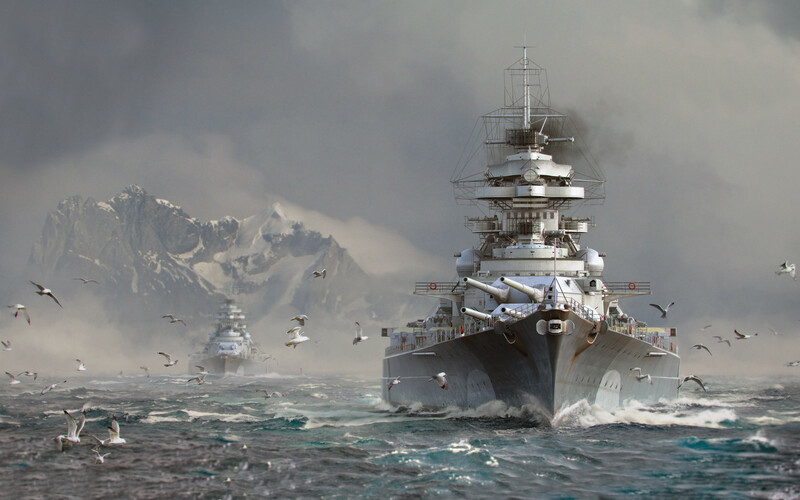 Scenarios III: Operation Rheinübung: Bismarck and Tirpitz sail together in the spring of 1941. As we already know, the battleship Tirpitz had been commissioned on February 1941, and was not ready for combat operations in the spring of 1941. On the other hand, it is interesting to note that the British battleship Prince of Wales had been commissioned in late March 1941, and spent only a couple of weeks of trials when she engaged Bismarck in the Denmark Strait. This ship was far from being 100% battle ready and even had dockyard workers on board. Nevertheless, she managed to score three hits on Bismarck. So, it is quite reasonable to believe that Tirpitz would have added a far greater punch than Prinz Eugen, whether she was fully ready for combat or not. Moreover, Bismarck and Tirpitz would have formed a more homogeneous pair such as Scharnhorst and Gneisenau, and, if one Bismarck caused such a fuss, it is not hard to imagine what two Bismarcks could have done operating together in the Atlantic. The Royal Navy would still have more warships available, but the balance changes a bit as the British heavy units now have to face sixteen 38 cm guns installed in armoured floating platforms that can move at 30 knots. In fact, the real problem for the Royal Navy wouldn't have been the numbers, but the capability to concentrate a strong, and above all, fast enough battleship force in the right place at the right time to face the German warships. The famous motto often applied on Bismarck: "faster than anything stronger and stronger than anything faster", perfectly illustrates what the Royal Navy has to deal with here. Let's assume things had developed as originally planned for with Bismarck and Prinz Eugen in May 1941. In order to have a chance of a victorious outcome, Admiral Tovey would have most likely changed the disposition of his force and would have reinforced Vice Admiral Holland's battle group with an additional warship (Repulse? ), while he himself stayed on King George V which would join the slow Rodney later. So, Bismarck and Tirpitz would have fought against Hood, Prince of Wales, and Repulse in the Denmark Strait. Interesting engagement, isn't it? Whatever the outcome of that battle could be, if the German battleships managed to reach the Atlantic, then Tovey would have to rely on carrier air strikes to damage or slow down at least one them. This wouldn't have been an easy task either as the Swordfish now have to face the AA artillery of two warships, and as one can imagine a lucky torpedo hit in a rudder does not occur every day. Finally, had Admiral Lütjens managed to shake off his pursuers and reach the Atlantic in condition to wage war on the British merchant shipping, the situation would be quite different than his earlier sortie with Scharnhorst and Gneisenau. The Bismarck and Tirpitz could attack any British convoy, even those escorted by a battleship. The Royal Navy simply didn't have enough warships to protect every convoy against two battleships of this kind. Scenarios IV: The German Naval High Command mounts a combined operation with the battleships Bismarck and Tirpitz, and the aircraft carrier Graf Zeppelin in the Spring of 1941. This is one of the most frequently asked questions among the public: What if Bismarck had sailed with the Tirpitz and the Graf Zeppelin? The answer is simple, if Bismarck and Tirpitz together already offer more than a threat to the Royal Navy, the addition of the aircraft carrier Graf Zeppelin definitely inclines the balance to the German side. It is not crazy to think about it. Launched on 8 December 1938, the Graf Zeppelin could have been ready for service long before the spring of 1941 if its construction hadn't been suspended in April 1940. Unfortunately for the Germans this carrier was never commissioned. Now, let's assume the Kriegsmarine sends the Bismarck together with Tirpitz and Graf Zeppelin to the Atlantic in the spring of 1941 to sink enemy shipping. The Graf Zeppelin, equipped with more than 40 aircraft (Bf 109T and Ju 87C Stuka), would not only have provided adequate air cover to the battle group, it would also have been able to launch air strikes on enemy merchantmen and warships if needed. The German carrier-based aircraft were far superior to their contemporary British counterparts, and the Bf 109 wouldn't have had any problem at all dealing with the old Swordfish and Fulmars, not to mention the big Catalinas. In addition, the Stuka dive bombers (with up to 1,000 kg/2,200 lbs. in bombs) could attack and inflict heavy damage on any British battleship force attempting to intercept the German battleships long before it could reach ballistic range. An embarked air wing permanently in the air, would have also helped with the reconnaissance, thus permitting to signal surface contacts to the battleships and U-boats, and a greater cooperation of all arms. This would have presented a big problem to the Royal Navy which most likely would have been unable to deal with such a powerful task force. The Graf Zeppelin was the best opportunity the Kriegsmarine had to turn the balance in its favour (especially in 1941), and not to put this ship in service was a great mistake. The lack of air support sealed the fate of excellent warships that were already difficult to sink without air cover, and that otherwise could hardly have been defeated. Scenarios V: Operation Rheinübung postponed until the autumn of 1941.